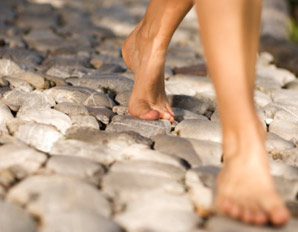 Walking barefoot is also called “EARTHING”….or “Connected to the earth. Basically, “EARTHING” means walking barefoot on grass, land, sand, stones and on wooden or tile floors in your house. It is good for our bodies to walk barefoot due to the relationship we have with the electrons of the earth and our bodies. The planet Earth has its own natural charge, therefore we will feel better when we are in direct contact with it. When your feet are in direct contact with the earth, the electrons from the earth will drain negative energy from your body. 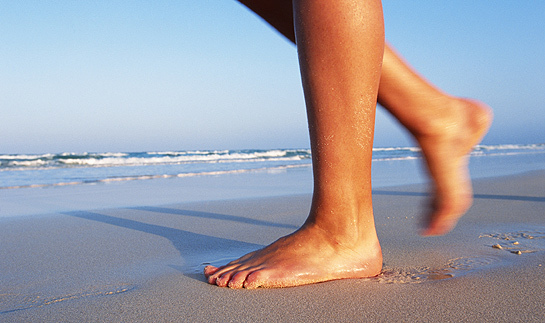 Your body absorbs electrons from the earth through the soles of your feet when walking barefoot. This energy is a very potent antioxidant helping you to have a healthy mind and body. Remember, we are electrical beings. Our body regularly produces positive charges which can oxidize and harm us if it is excessive. We have at least 100 watts or more of electricty flowing through our body, therefore, too much electricity can be bad for us. One good way to regulate excess electricity is “WALKING BAREFOOT” ….and let the EARTH cure us. If you live near the sea or a river, try walking barefoot in the water. The Police sing "Walking on the moon"
338.Frases para traducir al inglés 3.